The first step towards change is awareness. The second step is acceptance. To have a clear and better understanding of Parental Alienation and the related syndrome, you should have a grasp of a few key terms. Adultification - The premature empowerment of a child to assume authority, acquire knowledge and function in roles associated with adulthood. Alienating Parent (AP) - This is the parent that is alienating the child from the other parent through deliberate or subconscious tactics in the hopes of harming if not completely severing the child's relationship with the other parent. Mild alienation usually subsides after some degree of normalcy is established. In severe cases a parentectomy occurs and the child's relationship with the alienated parent may never recover. In severe cases the alienating parent frequently suffers from some type of personality disorder such as narcissism, borderline personality disorder, both or some other combination of mental health disorders. Alienated/Abused Child(ren) (AC) - This is the child or children whose relationship with the targeted parent is under attack by the alienating parent. Brainwashing of this child is complete when the child is so in tune with the desires of the alienating parent that they act on their own to denigrate the targeted parent in an effort to appease the alienating parent. This is much like what occurs with victims of "Stockholm Syndrome". The child may develop false damaging memories of the targeted parent and has truly grown to unjustifiably hate that parent. 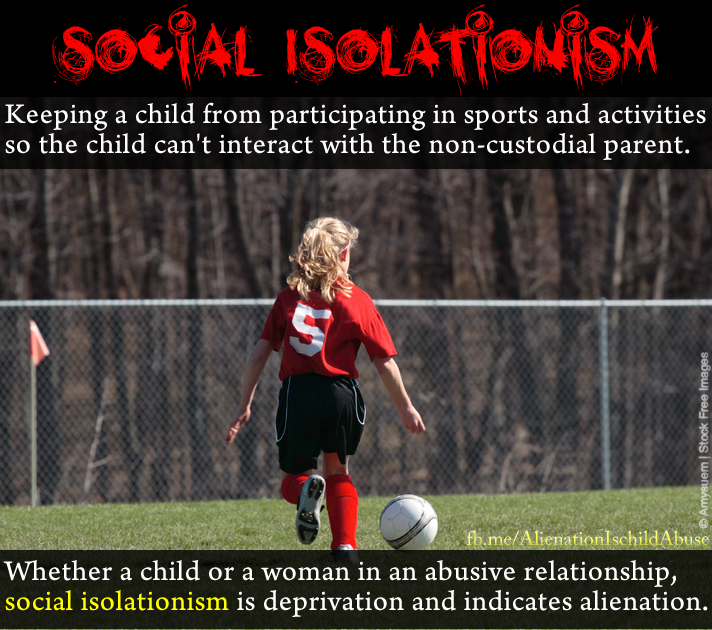 At this stage the alienating parent no longer has to aggressively employ alienation tactics as the child claims no outside influences in his/her feelings toward the targeted parent. The alienating parent now has a hands off position and falsely claims "there is nothing I have done to contribute to this behavior nor is there anything I can do about it." Alienating Disciple/Minions/Enablers (AE) - These are the witnesses to the obstructive alienating tactics of the alienating parent that choose to ignore what is being done. At worst these individuals actively participate and assist the alienating parent. Enmeshment (pathological) - when personal boundaries between two people are blurred to the extent that it is unclear where one person ends and the other begins. Enmeshment most frequently occurs in unhealthy relationships between a parent and child. Often children develop dysfunctional co-dependencies as a result. Fleas - Learned behavior inherited by an enabler but more frequently by a child raised by a person with one or more personality disorders. Because of their upbringing, they don't know any better because they don't know what "normal" is. Flying Monkeys (FM) - Essentially the same as Alienating Enablers. Like the FMs from The Wizard of OZ, they do the bidding of the alienating parent. Gaslighting (Crazy making) - is a form of mental abuse in which the abuser disorients a victim by attempting to distort the victim's memory or perception of reality. Examples can range from moving or removing objects from a previously known location to denial of facts previously known to be true but now twisted to be untrue or have a different meaning. Hostile Aggressive Parenting (HAP) - Another term for parental alienation in a high conflict parenting setting. Parentectomy - The complete severing or driving away of a parent from a child's life. Parentification - A role reversal form of adultification where a child is burdened with being a confidant to regulate the emotional needs of an unstable parent. Typically, the child is introduced to situations and information that adolescents and children are ill-equipped to process. The child may also be thrust into the role of caregiver to the parent and or siblings. Splitting - Commonly used by malignant narcissists and borderline personality disordered persons to preserve their self-esteem. This is the all or none, black and white view of situations and people. The narcissist will see targeted individuals as evil and themselves as good and pure. Splitting employs idealization, devaluation and denial. Targeted Parent (TP) - The parent that is being attacked and denigrated by the alienating parent in order to sever his/her relationship with the child. Other tactics used against this parent include false allegations of physical, emotional and or sexual abuse. Triangulation - Triangulation is the act of telling a third party something that should be delivered straight to the targeted party involved. It can be seen as a form of splitting where the agitator plays one person off the other. In a dysfunctional family setting, one family member may refuse to communicate directly with another family member forcing a third family member to be an intermediary. When used maliciously to manipulate, triangulation only draws others into a toxic drama campaign or scheme. Triangulators require a willing third party participant. Preferably a gullible third party that doesn't think critically or question what they are being told. Triangulation is essential to character assassination. Triangulation, if used with good intentions can be a good thing. Psychological therapy can include a form of triangulation using the therapist to create a positive triangle to come to a positive resolution of a given situation. Another form of positive triangulation can be like the United States negotiating peace between the Palestinians and Israelis.